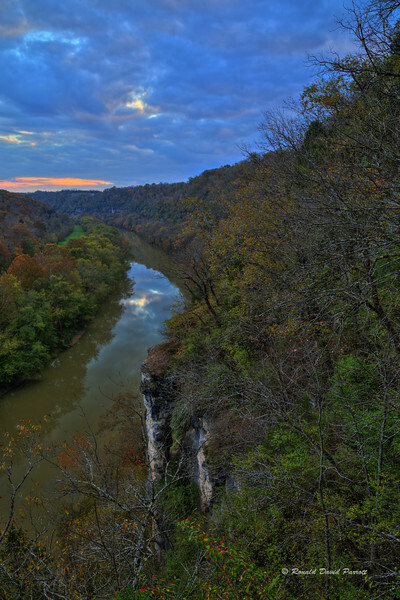 This view is from near the top of the Kentucky River Palisades, looking down on the natural arch named Devil's Pulpit and the river valley. Other spots along the way offer more close up views of the arch. The climb up to this spot demands careful planning, and a healthy respect for the perils along the way. I often used my tripod as a sturdy walking/climbing stick, and made sure to tie it's legs together with a ball bungee. I always took the time to adjust my tripod's height to the optimum position for each situation. Sometimes I placed my tripod handles around the base of bushes and small trees on the slopes above me so I could use it to pull myself upwards. During the descent I resorted to using a rope at one tricky spot. This is definitely not a family friendly adventure! My boat ride to and from this spot was perhaps my most memorable time spent on the Kentucky River so far. For a few miles the river was carpeted with colorful fallen leaves. On the return trip (after dark) my bright docking light lit up the leaves remarkably well. They all served as little reflectors to mark my route. An almost full moon seemed to move along the tree tops at first, and later it rose higher to beautifully light up some wispy clouds. Altogether it was a surreal scene, and a very enjoyable ride!